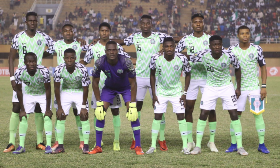 The Flying Eagles on Friday confirmed their qualification to the 2019 FIFA U-20 World Cup in Poland with a 1-0 win over hosts Niger which ensured they topped Group A of the CAF U-20 Africa Cup of Nations with seven points. Izuchukwu Okosi presents four takeaways from the crucial game. Right back Samuel Zamura had a shocking game and was the target of the Niger forwards as they made inroads from his position. The Plateau United right back got the first booking of the match and even the match commentator called his performance a "nightmare." 2. Niger Players Masters of the Dark Arts? With the score of the South Africa versus Burundi game reaching the Nigeriens, they became desperate and went to the ground too easily all in a bid to be awarded either penalties or free-kicks. Their players thankfully were unable to conjure the result they needed but that's also down to a good officiating - the referee did not crack under pressure from players or the host fans in the stands. At some stages of the match, the Nigerian defence were in sixes and sevens especially in the second half as Niger threatened to score. The duo of Valentine Ozornwafor and Igoh Ogbu have the ingredients to be fantastic central defenders but they were unable to withstand the hosts at times. Captain and left back Ikouwem Utim sometimes covered up for his teammates who left spaces behind. Coach Paul Aigbogun introduced forward Michael Effiom in the second half as the Flying Eagles searched for goals. The nimble footed number 19 created all sorts of problems for Burundi and South Africa and it was a bit of surprise that he had to come off the bench though he had little time to cause havoc.